It’s time again for my semi-annual NPB uniform roundup. This year, I’ve decided to break things up into two posts, so look out for another one later in the season, after more alternative unis are introduced. 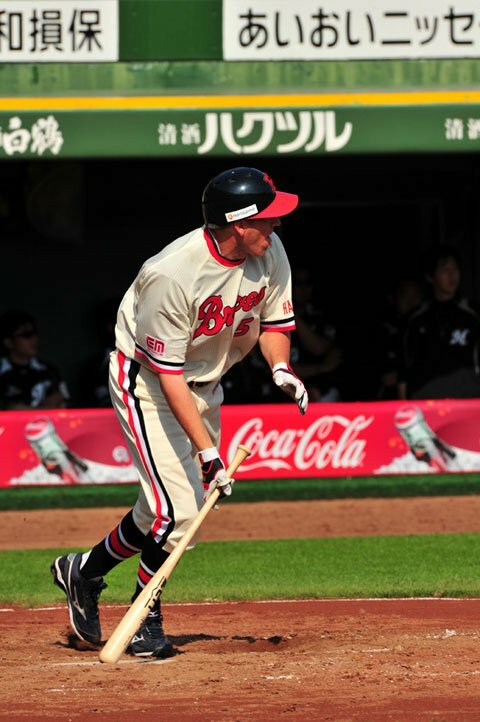 Orix has been wearing these throwback Hankyu Braves uniforms off and on. The most retro-looking guy is probably Mike Hessman. I hope to one day see Orix revive the old Kintetsu Buffaloes uniform and logo. I figure if they can advertise one Osaka-area railway (Hankyu) they can do the same for another (Kintetsu). Rakuten has only been around for seven seasons, so they don’t exactly have throwback uniforms… but that isn’t stopping them from running out these 1980’s Houston Astros knock-offs. I don’t know if I’ll ever get used to Nippon Ham’s gold road uniforms. 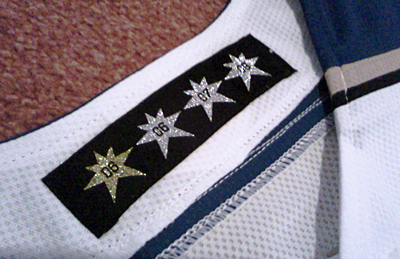 One thing that’s kind of cool about the new Fighters uniform is the tag on the inside of the collar, which has four stars representing the Japan Series title and three Pacific League titles that Nippon Ham has won in recent years. Hanshin has a spotty record when it comes to alternative uniforms, but this they’re going with these classic Osaka Tigers threads. This one isn’t an NPB uniform, but former Yomiuri and Yokohama closer Marc Kroon suited up in this Homestead Grays throwback for a 3A game a few weeks ago. Here’s last year’s uniform post. And 2009’s. Results may vary with the links on those pages. Update, July 2: Completely forgot about this year’s SoftBank Hawks alternates. Yomiuri will sport these cartoonish threads July 19-21 against Yakult. The uniforms were designed by middle school student Hikaru Nomoto, who’s design was selected from out of more than 13,000 entries. This season Seibu is wearing 70’s era throwback uniforms, from when the team was known as the Taiheiyo-Club Lions, prior to Seibu ownership. Nippon Ham chose a garish gold color for this season’s We Love Hokkaido uniforms. The differences between Yokohama’s normal uniforms and this season’s summer alternates are subtle, but pitcher Shun Yamaguchi still called them “unusually stylish”. I wouldn’t mind seeing them keep it simple and re-use these from a couple years ago. Orix’s summer uniforms are red this year, which elicits memories the old red Kintetsu uniforms. Orix also recalled the old Blue Wave team by wearing 1995 throwback uniforms in a game at Skymark Stadium last month. 1995, of course, was the year that Orix lifted the city of Kobe by reaching the Japan Series after the horrific Hanshin Earthquake. Today’s Japanese vocabulary is 復刻版ユニホーム, (fukkokuban uniform), meaning “re-issue uniform”, though in English we would translate that to “throwback uniform” or “retro uniform”. If you’re interested in purchasing an Orix Buffaloes jersey, you might want to get it now. The Buffaloes’ parent company, Orix, has announced that this will be the last season for the Buffaloes name. No word yet on what the new team name will be, but Orix wants to keep the unfortunate “B’s” abbreviation that has become part of the team’s logo. According to Nikkan Sports there is a low chance of Orix restoring team’s previous name, the Blue Wave. The Orix Buffaloes name originated with the 2004 merger of the Orix Blue Wave, and the Kintetsu Buffaloes. Orix originally bought into the baseball business in 1989, when the company took over the Hankyu Braves. 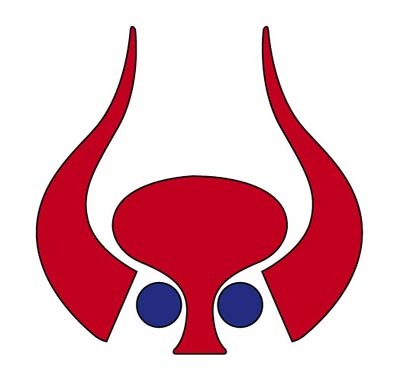 The Orix team was briefly known as the Orix Braves before adopting the Blue Wave name. 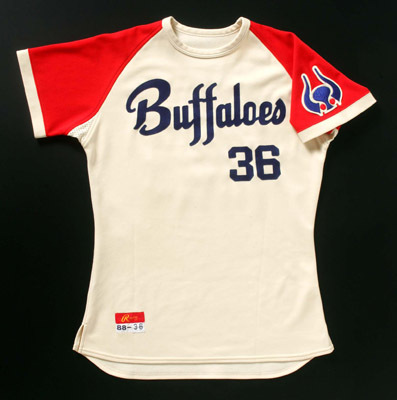 The old Kintetsu franchise was known as the Pearls back in the 50’s, and then switched to the Buffalo for a few seasons before correcting their English in 1962, adopting the still-active Buffaloes name. Gary Garland has the full histories of all the NPB team names on his site. I always liked the Blue Wave name, and was sorry to see it go. Any suggestions on what the new name should be? Yesterday, Tuffy Rhodes went deep three times, hitting home runs numbers 450, 451, and 452 of his distinguished NPB career. I didn’t think Tuffy had 100 home runs left in him when he signed with Orix during spring training in 2007, but he’s hit 92 since then and shows no signs of slowing down. Congratulations Tuffy! We’ll see you at 500! *Apologies for the somewhat crappy quality of the formatting on these charts — I made them in Excel and didn’t test on a wide variety of browsers. I was surprised to see that Orix has a positive run differential, but aside from that this is about what I expected. Only Seibu has really separated themselves from the pack, mostly due to a powerful offense. The teams are mostly even with each other; home/road splits and interleague performance might explain the differences in won/lost records. The Lions would have to really slump to miss the playoffs, but if someone else is going to take a run at them, now would be the time. Ace Hideaki Wakui, slugger GG Sato, and PL batting avg Hiroyuki Nakajima are all representing Japan in the Olympics and will miss most of August. I think they’re a lock at this point. The Fighters get it done with pitching and defense, outplaying their expected won-lost record by 3 games. The absence of Yu Darvish for the Olympics will be felt in Sapporo, as will that of leading batter Atsunori Inaba. Still I think they’re in good shape for a playoff berth. Masayoshi Son’s team wasn’t able to acquire the big bat they were looking for, and now they’re faced with losing twin lefty aces Toshiya Sugiuchi and Tsuyoshi Wada to Olympics, as well as table-setter Munenori Kawasaki. They’ll have to rely on rehabbing Nagisa Arakaki and their foreign starters throughout August to stay competitive. After a slow start, Lotte has played back into contention. Lotte is losing three key guys to the Olympics — lefty starter Yoshihisa Naruse, infielder Tsuyoshi Nishioka, and catcher Tomoya Satozaki, but has Julio Zuleta and Shingo Ono returning from the injured list. Those guys don’t quite balance out the stars that will be gone, but Bobby Valentine is confident. I’d love to see these guys make it the playoffs; Bobby has done a ton for Japanese baseball, they have great fans and a good group of guys. New manager Daijiro Ohishi seems to have energized the Buffaloes back to competitiveness, along with the resurgence of veteran import sluggers Tuffy Rhodes and Alex Cabrera. 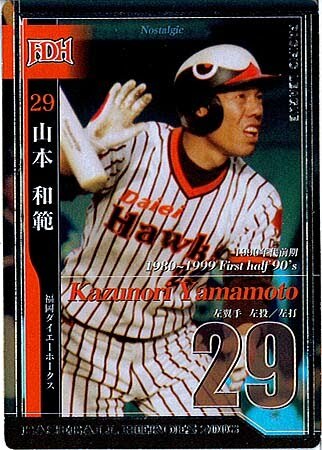 The presence of Kazuhiro Kiyohara could serve as motivational factor as well. Orix isn’t sending anyone to the Olympics, so now is their time to strike. I’d love to see these guys make the playoffs; Ohishi turning the team around mid-season is a great story and I’d like to Tuffy in the playoffs again. The Golden Eagles are sitting in last place despite their +11 run differential, which is 2nd best in the league. They’d have to go on a tear to come back from 11 games under .500, but it’s possible. Young righthander Masahiro Tanaka is Rakuten’s only Olympic representative. I’d love to see these guys make the playoffs; manager Nomura has done a great job making the team competitive and they have some great pitchers that would really be tough in a short series. So the Olympics will loom large in the already tight Pacific League playoff race. Should be a great pennant race! Orix has removed the interim tag from manager Daijiro Ohishi’s title. Ohishi has led the team back into contention after a dismal start to the season. In more Orix news, veteran slugger Kazuhiro Kiyohara appeared in his first game since 2006. Kiyohara entered the game in 7th innning as a pinch hitter, striking out swinging in his only at bat in what looks like the beginning of his farewell tour. Kei Igawa commented his removal from the Yankees 40-man roster on his blog. He mostly reiterates things that he’s said before: that he has no intention of returning to Japan and that he’s using this experience as motivation to reach the Major Leagues. Tokyo Big6 University League rivals Waseda and Keio are travelling to Brazil to play some exhibition games in recognition of 100 years of Japanese immigration to Brazil. The Royals designated Yasuhiko Yabuta for assignment, giving the Royals 10 days to trade or release the former Lotte reliever. Bobby Valentine comments on his Marines’ 2nd half chances on Marines.tv. Deanna treats us to postings on All-Star Game 1 and Game 2.